For Student Government Assocation (SGA) President-elect Abdulmajeed Baba Ahmed, learning has always been a passion of his. 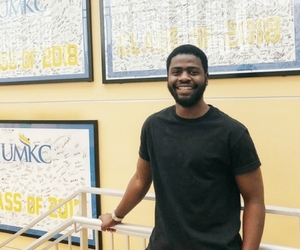 First studying in his home country Nigeria, Ahmed came to the U.S. to complete 160 credit hours at JCCC, graduating with two associates degrees before he transferred to UMKC earlier this year. “I am from Nigeria, but I’ve lived here for quite some time, so it’s like I’m from around here, but I’m not,” said Ahmed. On top of his two associate degrees, Ahmed took pre-engineering courses before transferring to UMKC as a mechanical engineering major. While Ahmed has only been at UMKC for a few months, he’s had a positive experience at UMKC so far. He was initially worried about not fitting in, which played a role in how he campaigned for SGA President. Running on an independent ticket, there were times when Ahmed doubted his ability to take the election. Ahmed won the election with an upset, ahead by seven votes out of 829 votes cast. He was also the only independent candidate to win an election this year. Ahmed’s family in Nigeria was thrilled to hear about his race for president. Ahmed will serve as SGA president for the 2018-2019 school year.